Hello again! 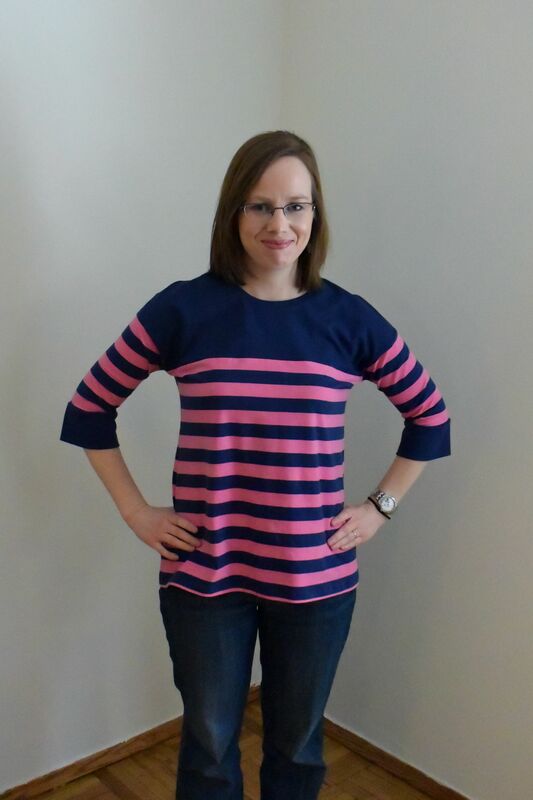 I am back to share another completed project: the Marianne top! 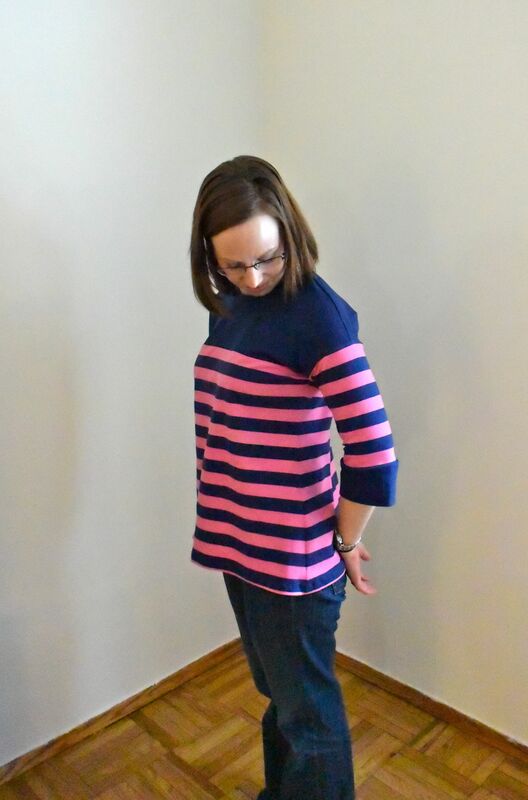 I had to take some side snaps to admire that stripe matching. I’m fairly OCD about that – which is why I avoided stripes for awhile – and this one turned out pretty successful. But, I’m confused about that back. It feels totally normal on my back, but then I saw these pics with the wrinkles and such. Not sure what’s happening there. I pulled it down in some other pictures, and that just made the wrinkles go vertical. Perhaps I need to do a little research. Pattern deets: This is the Marianne dress pattern by Christine Haynes, except (obviously) I modified the dress to a top. It was an easy adjustment, although now I’m wondering if I did something wrong that’s causing the back to look odd. 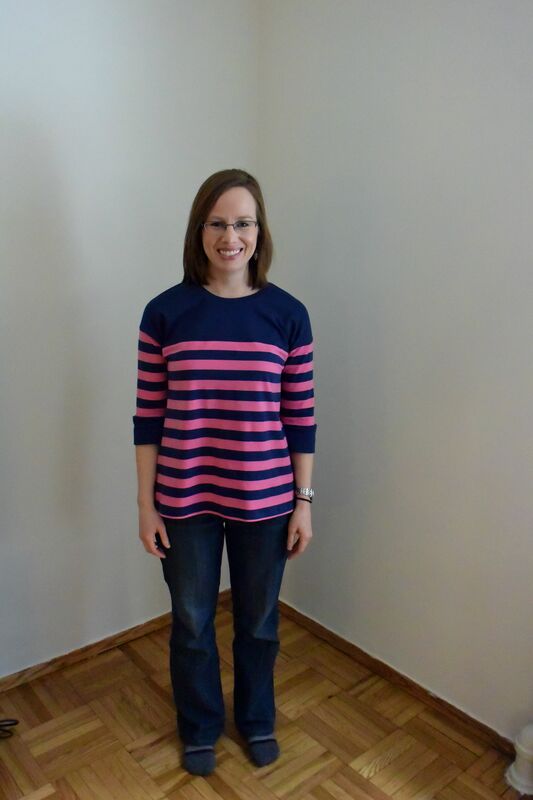 Anyway, I love colorblock tops like this (esp the RTW Boden ones, though those are a bit more of a boat neckline.) Pattern was easy to follow and straight-forward. 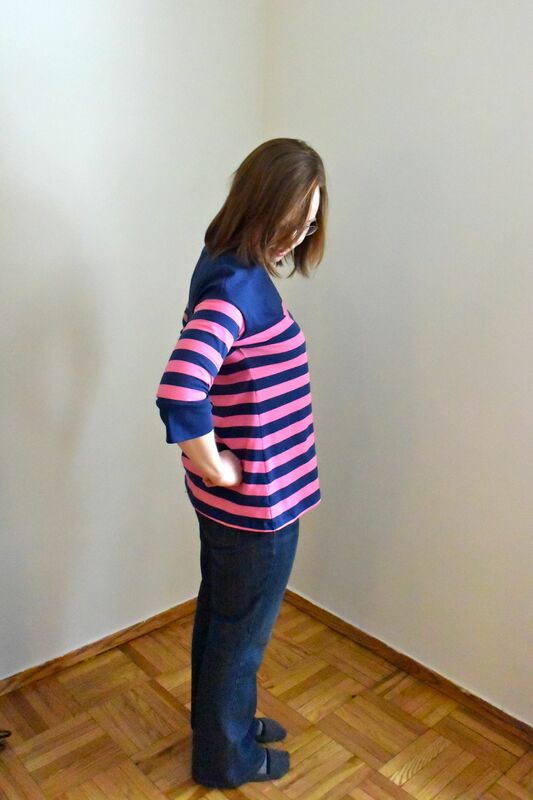 Everything matched up perfectly, and I especially loved the neckband drafting because it fit in so well. Neckbands (I think) are the most difficult part of knit tops so I’ve come to really appreciate well-drafted ones. Size-wise, I graded from an 8 in the bust to 10 at hips. At first I thought the sleeves were too tight and regretted not just tracing a straight 10, but now they seem to fit OK. I’ll probably wear it a few more times before deciding if I’ll make a different size on the next round(s). Fabric deets: Both of these are Riley Blake knits, purchased here and here from fabric.com. 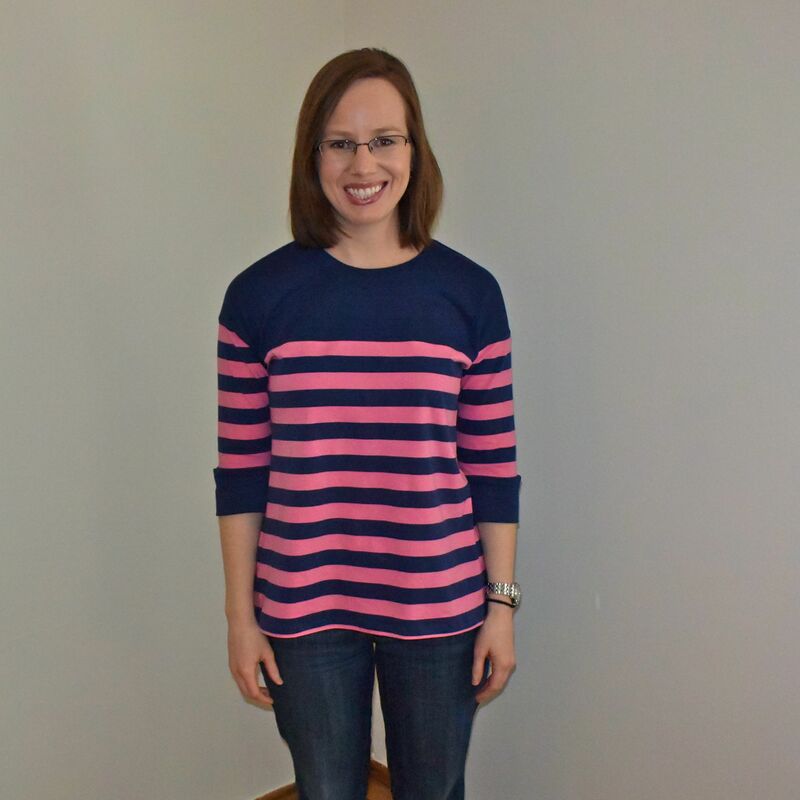 I had the stripes first, then figured if I wanted to find a perfect navy match (is it just me or are there lots of navy variations?) it’d be safe to go with the same company/line. Happy to report that thinking paid off. I bought 3 yards of the stripe for some reason (on sale most likely), so you’ll be seeing more if it (a Coco and penny pinafore – more on those later). These knits are substantial and easy to work with, except for the curling that comes along with cotton jersey. That’s all for now. Hope y’all are staying warm! Love that pattern. It would make a gorgeous dress for you. With stripes matched as well as those are! Good for you! thanks Linda! I may make the dress version one of these days.